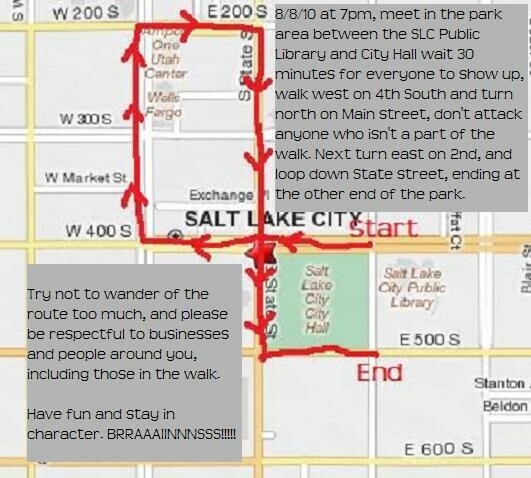 You may have noticed we haven't posted anything or advertised this year's SLC Zombie Walk at all. --- The reason behind this: no one sent us any information about it until 6PM last night. Probably due to finalization of the route. Otherwise we would have been pimping this out over a month ago and encouraging every single one of you undead lovers to venture out this Sunday and take part in it. Especially since (yet again) no one has contacted the city to organize a Halloween parade, which we sorely need in many ways. So here's your official 48 hour warning for those of you interested in taking part. 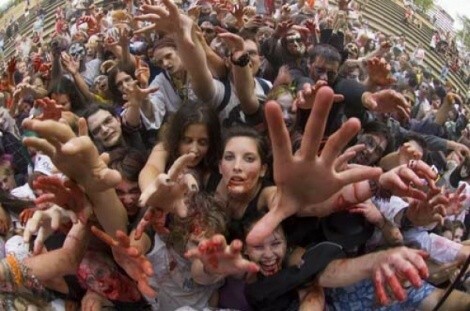 All you need to do is gussy yourself up like a zombie (or for some of you with brave souls, living survivors fighting against the horde of flesh eaters) and then make your way up the parade route starting at 7PM on Sunday. Which you can check out below with details. Originally it was set to go through the LDS owned section of Main Street, but has clearly been changed to a smaller area starting at the Library. Bit of a shame too, it would have been nice to see a photo of two zombies kissing by the pond in a defiant act of post-apocalyptic marriage. Speaking of, photo taking is highly encouraged, and I'm sure we'd love to see your pictures. Those in charge strongly urge you to be respectful of non-participating on-lookers, as well as businesses in the area. Crawl on, living impaired!